A new study suggests that improvements in air quality over the Potomac watershed, including the Washington, D.C., metro area, may be responsible for recent progress on water quality in the Chesapeake Bay. 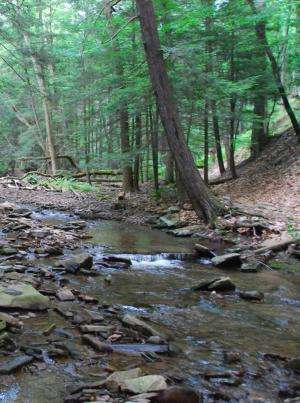 Scientists from the University of Maryland Center for Environmental Science have linked improving water quality in streams and rivers of the Upper Potomac River Basin to reductions in nitrogen pollution onto the land and streams due to enforcement of the Clean Air Act. The Chesapeake Bay—the nation's largest estuary—has suffered from excessive nutrient pollution and widespread hypoxic (low oxygen) conditions for decades. While land-based best management practices and improvements to wastewater treatment plants have been credited with beginning to turn the tide against nutrient pollution, researchers have found that improvement in air quality—specifically reductions in atmospheric nitrogen deposition—have been the primary driver of improvements in water quality in the Upper Potomac River Basin, which covers nearly 12,000 square miles in Maryland, Virginia, West Virginia, Pennsylvania, and the District of Columbia. These unanticipated region-wide water quality benefits were brought about by reductions in harmful emissions of nitrogen dioxides following implementation of the Clean Air Act of 1990. "Most best management practices—like a riparian buffer or retention pond—only impact a relatively small area," said Eshleman. "You can think about the Clean Air Act as a best management practice that affects every square meter of the watershed." Nitrogen deposition occurs when nitrogen in the atmosphere—emitted mostly by fossil fuel combustion—falls to the ground or water surface. When the amount of nitrogen falling exceeds what trees and plants need to grow, nitrogen saturation may result. When excess nitrogen enters streams and waterways, including the Chesapeake Bay, it can cause algae blooms that significantly impact marine life. Researchers examined water quality trends in streams and major tributaries of the Upper Potomac River Basin from 1986 to the present. Their analysis revealed nearly "universal improvement" in water quality. In particular, researchers found that atmospheric nitrogen deposition began to decline in 1996—the same year that emission limits on coal-fired boilers were first put into effect. Decreasing nitrate concentrations in the Upper Potomac River began declining shortly thereafter and continued to decline through 2012, rapidly reversing nitrogen saturation in the basin. The paper also suggests that future additional water quality improvements in the Potomac are likely as coal-fired plants are replaced by cleaner-burning natural gas and renewable energy sources.